Compute Wall Spacing On Your iPhone for Free! Pointwise's first mobile application, Y+ Calculator, is available for free on the App StoreSM. The new Y+ Calculator is a handy tool for calculating the grid spacing at a wall to achieve a target y+ value for turbulent computational fluid dynamics (CFD) computations. Simply specify the flow conditions, the desired y+ value, and compute your grid spacing. The calculator supports either SI or Imperial units and can be quickly reset to sea level conditions. Apple, the Apple logo, iPad®, iPhone®, and iPod® touch are trademarks of Apple, Inc., registered in the U.S. and other countries. App Store is a service mark of Apple, Inc. 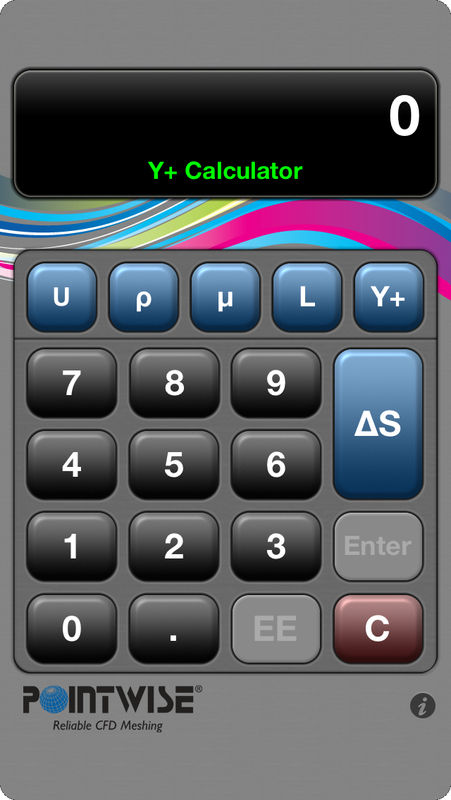 The Y+ Calculator, Pointwise's first app, is available for free in the App Store.